A powerful solution for broadband connections that leaves all other satellite services in its wake! 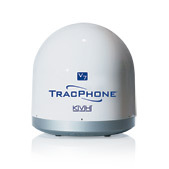 Now you can rely on broadband at sea the way it was meant to be thanks to the revolutionary TracPhone V7 with mini-VSAT Broadband service, the newest, most affordable option in marine communications. It’s the ideal way for you, your passengers, and your crew to stay connected with the same high-quality broadband data connections you use onshore. In fact, mini-VSAT Broadband creates a “cable modem” experience at sea while offering great coverage, outstanding network traffic management, and consistent performance. The result? You get exactly what you expect with regard to service speeds, reliability, and unlimited access, all for much less than what you’re used to paying. Plus, the optional crew calling system makes it easy to offer crew and charter guests access to a dedicated VoIP line. Rugged TracPhone V7 is 85% smaller and 75% lighter than standard VSAT antennas so it’s easier to install and less expensive to operate; also available in larger dome to match the TracVision M9. KVH products are sold and installed by an authorized network of qualified installers around the world. In order to receive a system and installation quotation, go to "Where to Buy" and find the KVH dealer/distributor nearest to you.